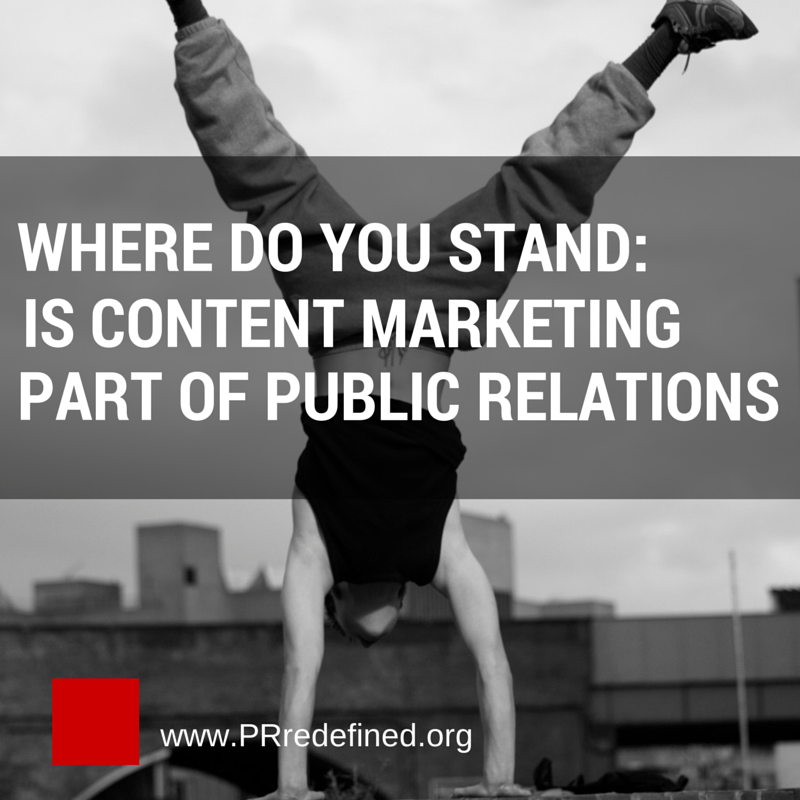 » Should public relations own content marketing and where does brand journalism sit? I recently moderated a month-long conversation on whether or not public relations should own content marketing. The discussion was held by PR Redefined, an international movement aimed at stimulating new thinking in public relations. It was a lively debate which spilled out on to the LinkedIn group for the Chartered Institute of Public Relations (CIPR). The upshot: two-thirds of those who took a quick poll thought ‘yes’ content marketing’ should be owned by public relations. Not surprising news, I grant you, given the profile of the two communities where the conversations were held. But it was the journey rather than the destination which was interesting. The comments added broad insight into current public relations practitioners’ psyche. 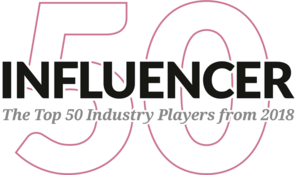 I put together a story on Storyify which curates the flow of the PR Redefined conversation throughout the month. You can read it here. The thread to the CIPR LinkedIn discussion is here. You can find the community page for PR Redefined here, along with all of the comments surrounding the topic. Should public relations own content marketing? Should public relations own content marketing? The word ‘ownership’ speaks to me of fiefdoms. Building walls around specialisms can no longer be best practice – or commercially sensible – as the lines surrounding communications’ disciplines become ever more blurred. At the other end of the argument, to say content marketing has no business within the public relations discipline seems too prescriptive. My view? I think it has less to do with the activity of creating content and more to do with the intent behind it. The driving purpose. The call to action. Action is the driver for all communications. For public relations practitioners the action is concentrated on changing or reinforcing behaviours and attitudes to build awareness, credibility, and perhaps to positioning the client’s organisation as a thought leader. For the marketer the focus is on generating sales and then loyal customers – in other words: making some sales then some more sales. Throughout the debate on whether public relations should own content marketing the definition of content marketing was assumed rather than made explicit. As such the term was probably used interchangeably with its close cousin – brand journalism. Whereas brand journalism – or brand publishing as Weber Shandwick refers to it – is all about surfacing, shaping and then sharing brand stories so as to build awareness and affinity leading to long term mutual understanding between an organisation and its publics. It combines the idea of good storytelling and good journalism with the idea that an organisation can showcase its own expertise without having to sell it. Just tell it … don’t sell it. Incidentally, I agree with Weber Shandwick’s use of “publishing” over “journalism”. It removes any potential conversation about the content’s objectivity. So, to my mind whilst brand journalism and content marketing complement each other they are distinct disciplines; brand journalism occupying the upper reaches of the marketing funnel whilst content marketing sitting down lower and helping to drive sales. Both brand journalism and content marketing will achieve more than the sum of their parts when integrated within a wider marketing communications or public relations strategy delivering business objectives. 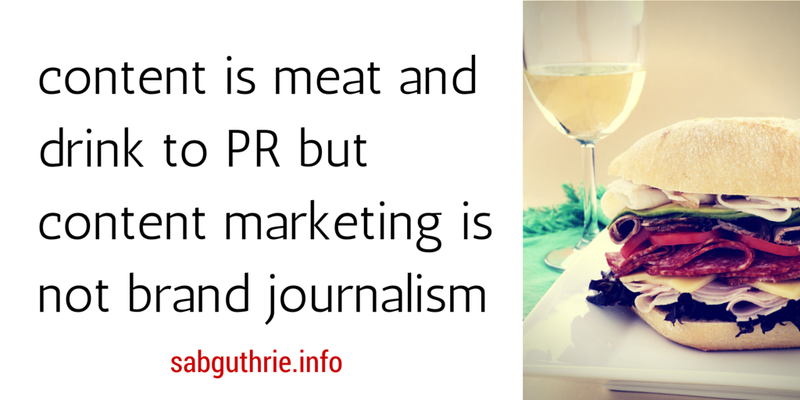 Creating content is the public relations practitioner’s meat and drink. But we’ll also need to equip ourselves with a new set of technical skills beyond writing. As Tom Foremski puts it: “the complexities of managing fragmented media channels and user interfaces across many devices requires integrated tech, media, design, SEO and communications professionals on the same publishing teams”. The CMI’s view gives PR a dual function: a resource to be tapped before the serious creative work is done by the content marketers. And, as content distributors – but presumably in the context of the increasingly irrelevant role of media relations experts. What do you think? Can brand journalism be segmented from content marketing or are they the same beast? I like some of the discussion here but I feel this is a Silo question. My friend Lindsay Bell shared this on Twitter. And she works for Gini Dietrich who wrote a book about breaking down silos. I feel ‘Content Marketing’ is being used like Social Business these days to increase agency billings while being very deceptive. If you ask me what is content marketing? It is so broad that PR is not qualified to handle over 50% or more of these things: Product Catalogs online and Print. TV commercials. In fact all advertising is context marketing Email Marketing. Store Layout online and brick and mortar to display your ‘content ie things you sell’. The things you sell. Blog posts. Press Releases. Brand Videos. Social Media. Promotions. Sponsorships. Trade Show Exhibits. Store Signs/Logos. Community Engagement/Charity Work. It is all content marketing. Can PR handle all this? Are they best fit for it? For the big businesses not all need content marketing. I can win the SEO battle if I win the Ad Words bids. While Boeing’s history of success is a nice story they have had epic failures. So when they bid on a NASA project it is really the content of their proposal and the engineering work and the sale person schmoozing the prospect than anything PR could ever do for them. Or their airplanes often come down to catalog sheets test plights and cost to operate per mile flown ratioed with how many seats they have. So the whole thesis of todays hot button content marketing to me is very suspect and needs to be handled carefully with someone above PR/MKTG etc leading everything and directing who does what and would draw from Sales, Mktg, Advertising, PR and Customer Service to achieve the business goals. Hi Howie – Yes, the headline does point to a binary answer. Few, if anything, in life is so simple. 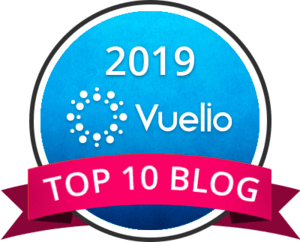 The blog post’s subject was the topic of debate at http://www.prredefined.org and designed to be open-ended, to provoke contribution from community members and to move the discussion on. One of the contributors, Lyndon Johnson, founder of Think Different [LY] would agree with your point about content marketing being a ruse to increase billable hours. I make the point in the post that “The word ‘ownership’ speaks to me of fiefdoms. Building walls around specialisms can no longer be best practice – or commercially sensible – as the lines surrounding communications’ disciplines become ever more blurred.” I think content marketing and brand journalism both have important places within the communicator’s armory but that they must form part of an integrated communications plan. All communication is about action. Everything an organisation does or says is a form of communication. You describe well the ephemera or touch points/marketing collateral at an organisation’s disposal. I’m not wholly sold that all marketing collateral is the same as content marketing – if you go by the CMI definition (see post). By the way, have you heard of Betteridge’s Law? Ian Betteridge argued that any headline which ends in a question mark can be answered with the word, no! Interesting article. I found myself wanting to know more about your aside re “the increasingly irrelevant role of media relations experts”. Can you expand on this one please? That line was written from the point of view of content marketers. But it is a view I have sympathy for. The media landscape has fragmented. The social web has allowed brands to hold conversations directly with their publics/ audiences. This has freed up PR practitioners from being so dependent on chasing pick up from mass media. Earned media will remain important – especially in niche areas. But increasingly it will form part of an integrated campaign which may include paid, earned, shared and owned (PESO). I’m glad you found the article interesting. Thanks for reading through to the end. Hey Scott, Good blog. you have conveyed PR and content marketing togetherness in a practical scenario, they both share a common goal: to create a quality message related to our brand, relay and amplify.